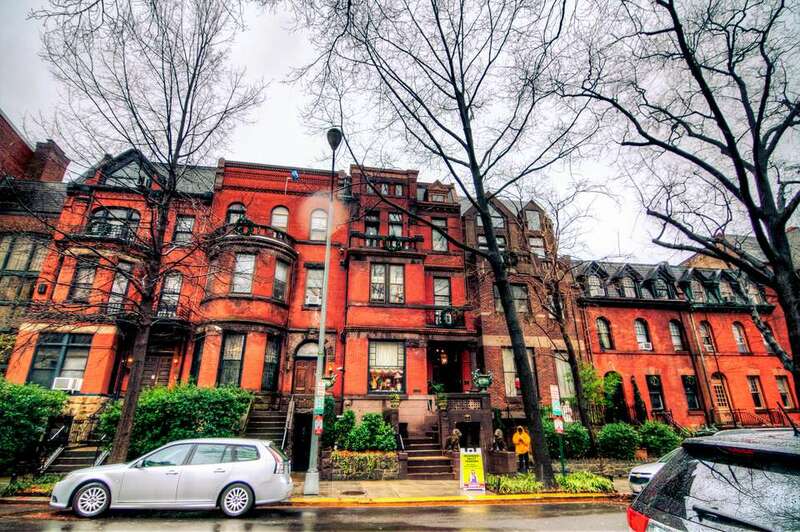 The Mansion on O Street is an unusual place and one of Washington’s best-kept secrets. It is a non-profit organization and museum, a bed and breakfast, a conference and event venue, and a private club. The Mansion was created more than 30 years ago by H.H. Leonards-Spero as a haven for artists and a place to allow visitors to unwind and be creative. The Victorian-style home resides on a quiet street in the heart of Dupont Circle and is actually five interconnected row houses with more than 100 rooms. The entire property is decorated with donated items and retains many period details from the 19th and 20th centuries. Everything is for sale (except for the guitars that have been signed by famous musicians). The décor is colorful and includes an eclectic collection of antiques and memorabilia. The furnishings change often. Over the years, The Mansion on O has been a haven for heads of state, foreign dignitaries, business leaders, writers, artists, musicians, and scientists. As a non-profit organization that operates primarily by donations, The O Street Museum Foundation encourages and embraces creativity through programs such as artist-in-residence, live concerts, workshops and kids programs. With more than 100 rooms, 32 secret doors, 15,000 pieces of art, and 20,000 books, the Mansion is an interesting place to explore. A wide range of tours are available including treasure hunts, self-guided tours, group tours, book tours, music tours, breakfast tours, afternoon dessert tea tours, champagne tours and more. Advance online reservations are required. The Mansion on O Street offers 23 guest rooms ranging in price from $350 to $6,000 per night (for a 5,000 sqft unit that sleeps 18). The accommodations are unconventional and may not appeal to individuals who prefer standard hotel rooms. Each room has its own theme and distinctive décor. Some of the rooms have kitchens, while all of them have private baths and modern amenities, internet access, and a complimentary breakfast. Per diem rates are accepted for government employees. Long term stays and group rates are available. The Mansion is conveniently located within walking distance to a variety of museums, restaurants, bookstores, and private art galleries. The closest Metro station is Dupont Circle. The relaxed environment of the Mansion on O makes it a unique place to host a conference, business meeting, wedding, reception or another special event. There are 12 conference rooms and private spaces that can accommodate small gatherings or up to 300 people for a large event. Catering and event planning services are available. There is a large commercial kitchen and a five-star chef. The Mansion on O offers annual memberships that provide exclusive benefits including discounts on hotel rooms, Sunday champagne brunch and tea service, complimentary passes to weekly events, late night dining, library loan program (music & books), private meals, complimentary interior design and/or art consultation and much more.